If you would like a copy of the document, please let us know. We are developing the concept. Your feedback and involvement is appreciated. Thanks! 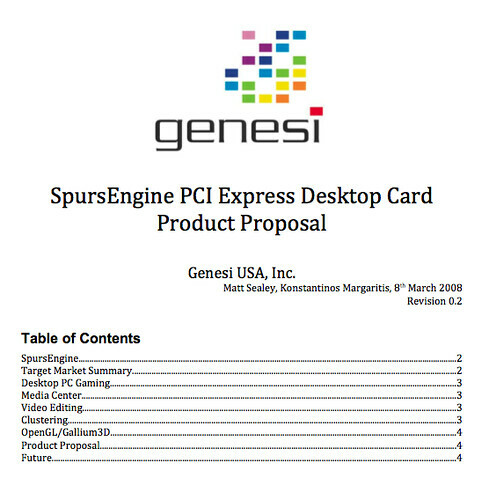 Just in case you didn't know what SpursEngine was before now, it's a chip developed by Toshiba which integrates Cell SPE's with a PCI Express bus (rather than a Power Architecture control processor) and dedicated video encoder/decoder units (for MPEG-2 and H.264) making it basically an add-on chip to already existing processor solutions, rather than a discrete computing platform. The applications are somewhat obvious. I think we will have to wait a little to find out the official nature of certain Physics APIs on several operating systems (Havok got bought by Intel, AEGIA has been bought by nVidia.. Microsoft rumbled about an API in DirectX 10 but haven't produced it) and find some more convincing applications and library support for acceleration beyond a fancy alien-signal-search screensaver. It would be nice to get opinions on what you would use it for if you had it. The plan is to support it as any generic plugin card would be - Windows, Linux, source code and examples, maybe a bundled application.. the idea is to bring Cell to everyone, in a low-profile desktop form factor..
Last edited by Neko on Mon Mar 24, 2008 2:25 am, edited 1 time in total. I would like to read about it! If you have some programmers at hand i would think about adapting Mencoder and Blender to your card. It looks like the Cell laptop is coming this year. Any updates on the PCIe SpursEngine? Post subject: Re: Any updates? ...Toshiba needs to be interested in what we are proposing first. The folks that we worked with on the ARM9 based system are not the same people and everything runs back to HQ in Japan. It takes time to get the attention and interest of the right people. from Fixstars, now it's available... and it's cool! We are currently proposing something very much more in the areas of a passively cooled, unintrusive system which will not impact the cooling budget of a system and not generate too much noise. er, guys, this is NOT the SpursEngine chip, this is the PowerXCell 8i (which by many is considered a Cell 2 or Cell+ chip, fyi, the Cell 3 will most likely come in 2010 and will carry an advanced PPU and 32 SPUs). The PowerXCell card is not even in the same league as the SpursEngine, mostly targetted at HPC solutions. Obviously, the point I'm trying to make being that using a full Cell processor gives you a card like that; you can't cut it down or passively cool it easily. It will never be single slot and low profile. Just focus on the low power, high performance potential of the SpursEngine (which can be passively cooled if done cleverly) and not how BIG we can make it. Sometimes numbers aren't important; functionality and price is. Do you want to spend $8500 on a full Cell which probably requires running a full Linux on it, or $250 on a SpursEngine and use two cards to get a "full" 8 SPEs interfaced with your current server or workstation? What if you only needed the power of 4 SPE units anyway? Wouldn't you be wasting your money on a PowerXCell 8i? SpursEngine has to rely on the host computer to handle things like networking but this is not a big deal. Have you ever seen a workstation that did not have gigabit ethernet or even two? Oh, I don't really doubt that, and this card won't fit any normal mid-tower/desktop PC case anyway, I guess it needs some huge tower server case -not to mention lots of power. Actually, I doubt even 2 or 3 SpursEngine cards will reach the total performance of this PowerXCell 8i card (perhaps it will reach the PS3 Cell BE performance, in some cases) but on the other hand, it will be much easier to program for, and way cheaper. The fact that one could create a bunch of those in a big case (how many PCI-e cards can one fit in a case anyway?) probably means one could get better total performance than a single powerXCell card anyway, at a fraction of the cost (I guess the code modifications would be minor as well). It won't but I bet it could be close. You're looking at a 1.5GHz chip with 4 SPEs, linked across a single PCI Express lane on the reference design and Leadtek card, but the chip spec they announced earlier in the year said the chip is capable of a 4-lane link. This basically means you get between 250MB/s each way on the low end, and 1GB/s each way on the high end. This only matters if you're doing transfers to the host though; the 128MB of XDR RAM on the SpursEngine reference card would be uploaded with data, and the SPEs set to run that code. They would operate on that data and output data to the same memory (or to system memory if needs must). As many as you have slots. If you go for 1x card then you can fit 4 of them in here. at a fraction of the cost (I guess the code modifications would be minor as well). Well if Linux spufs was working it'd be absolutely identical except for the code running on the host processor (no PPU assembly please :) - DMA from the SPE local memory to the XDR is handled the same as on Cell, and DMA from XDR to PCI Express is handled just as any other PCI Express card, just like a graphics adapter, and I'd suppose you'd deal with it in exactly the same way too - upload a texture, process it, download it back to the host again. Or with the MPEG encoder and decoder on the chip, pass it right back to that, and then get the compressed data back for saving to a file.